A few months ago I was on a train with some schoolgirls, and caught glimpses of their badge, with a motto which was something like Building Success Through Achievement. 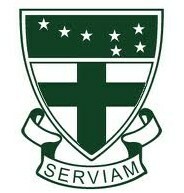 I reflected on the difference between this and my own school motto - Serviam (Latin for "I will serve"). Was it better, I wondered, to inspire girls - in both school cases from working class, lower-income, largely migrant backgrounds - to aim for achievement and empowerment, or to aspire to a spirit of service? My inner jury remained finely balanced, for all sorts of reasons. I'm recalling that reflection and our motto again today, feast of St Angela Merici: the strong, faithful Lombard (like my mum!) who, in 1535 founded a small, parish-based Company of St Ursula, which over the centuries has become an international order of women dedicated to education. You can read more about Angela here. I benefited from that education at the Ursuline Convent High School in Wimbledon from 1976-1981, and today I pray in gratitude for the strong, inspiring teachers we had, and the opportunties that school gave me. Serviam, our motto, is also the motto of every Ursuline school: regardless of location, or pupils' social or economic background, all wear a badge proclaiming their intention to serve - not to strive or aspire or succeed, but to serve. Whether we do or not is another matter, of course, as is our subjective views on those words "serve" or "service" - I imagine the millionaire's daughter and the servant's daughter would have different ideas of what it means to serve. Here, for the first time, I heard two parallel calls to service: to be as Christ, radiating the love, care and humility of Christ, who came not to be served but to serve; and to allow others to do that for me. And of the two the second can be the hardest! It can mean allowing myself to be weak, to be cared for in illness, asking for and accepting help, knowing I don't have all the answers and I can't go it alone... and whilst we joke about wanting to be waited on hand and foot, the reality is that many of us would rather struggle on unaided than admit we need help - that we actually need to be served. So many forget that "Without God I am nothing" is not merely metaphorically true - it is literally true.Knowing, Loving and Serving God is our answer to the why - and it's the only source of true happiness; but what is happiness? Look to the Beatitudes - they are not trite aphorisms but the most important of Our Lord's moral teaching - the great paradoxes upon which our very being and our future in Christ depend.